January finds New Orleans transitioning from Christmas to the Mardi Gras season and the city continues its storied revelry with a full slate of fun events. The Carnival season leading up to Mardi Gras on February 13 officially begins on Twelfth Night, January 6. 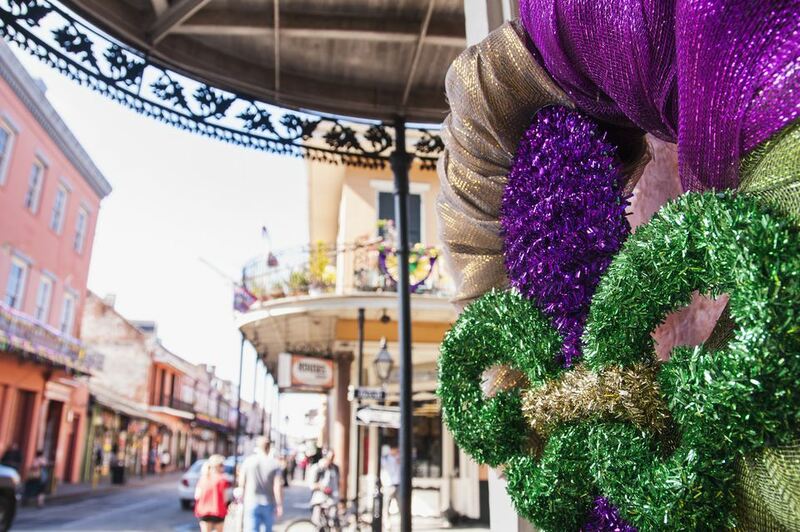 On this day, New Orleanians eat their first slices of the celebrated king cake; take down their red and green celebrations and replace them with purple, gold and green ones; and begin the celebrations that make the city famous around the world. With an average high temperature of 62 degrees Fahrenheit and an average low of 43 degrees Fahrenheit, January in NOLA feels colder than the thermometer might indicate. The chilling humidity burrows into your bones and can be hard to shake. So bring warm clothes: long pants, a mid-weight coat, and sweaters or hoodies for layers. You can also make good use of a hat, scarf, and gloves. You definitely need good walking shoes, and if you plan to dine in the evening at Commander’s Palace or another of the finer old-line restaurants in the city, bring a dressy outfit (jackets for men). Then fill your social calendar with these January 2018 event dates. This major college football event takes place on January 1 each year in the Mercedes-Benz Superdome and pits two national-caliber teams against each other in an always-exciting game. Jason Momoa, Nichelle Nicols, and Stan Lee are just a few of the star's fans might meet at this convention held at the New Orleans Ernest N. Morial Center on January 5, 6, and 7. The daytime and early evening hours of the show and its proximity to the party-friendly French Quarter (just zip over on the Riverfront streetcar) make for both days and nights of fun. Each year, history experts in period costumes reenact Andrew Jackson’s victory at the Battle of New Orleans at the Chalmette Battlefield. Visitors enjoy living history events, tours of the site, craft demonstrations, period music and dance, and more from January 5 to 8. Marching through the French Quarter, this medieval-themed walking krewe annually celebrates New Orleans’ French heritage on January 6, the birthday of the famous Saint. The parade ends with a king cake-cutting ceremony, which marks the first bite of the season for devoted locals who only eat it during Carnival. While the Krewe de Jeanne d’Arc parades through the French Quarter, this masked and rowdy krewe takes over a handful of St. Charles streetcars on January 6, riding the stretch of the streetcar route from Carrollton to the French Quarter to herald the start of the Carnival season. Parrotheads galore flock to the French Quarter January 11 to 14 for this weekend celebration of Jimmy Buffett and all things tropical. With live music, parades, and food and drinks galore, plus more tie-dye and Hawaiian shirts than you knew existed, it’s really quite the scene. Dr. Martin Luther King, Jr. Day on Monday, January 15 and the weekend preceding it fills with marches, gospel and jazz music concerts in churches and performance halls all over town, at least one or two parades, and more service events than you can count. Locals typically welcome visitors, and these events (especially the service-oriented ones) can give tourists a way to really connect with the city and its residents, so keep an eye out as the date draws closer for ways to join the celebration. These two satirical krewes team up for the first major parade of Carnival season, a decidedly R-rated affair which rolls through the French Quarter on January 27. It’s a locals-oriented parade but a blast for visitors, too. June in NOLA Means Hot Weather, But it's Still a Great Time for a Visit!